The first session of the Keeneland January Horses of All Ages Sale opens Monday at 10 a.m., and the Paulick Report once again offers a print publication online and on the sales grounds. 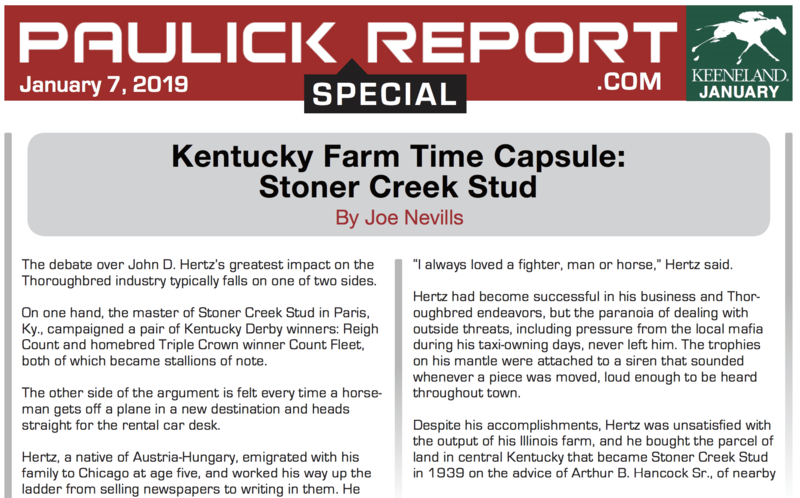 In the Keeneland January Book 1 edition of the PR Special, Joe Nevills enters the Kentucky Farm Time Capsule to examine the ties between Triple Crown winner Count Fleet and modern-day car rental, and how it all came together at the former Stoner Creek Stud. He also puts the Stallion Spotlight on Hill 'n' Dale Farms' Flintshire and goes down the top offerings of the auction's first two sessions in Ten to Watch. This issue's Honor Roll focuses on Keeneland January graduate Mind Your Biscuits, who could garner no more than $47,000 at auction in three attempts, but retired with seven-figure earnings. Ask Your Veterinarian discusses how Potomac Horse Fever is a broader threat than its name implies, while Ask Your Insurer examines the differences in coverage plans and processes for broodmare prospects versus veteran broodmares. This entry was posted in PR Special, Ray's Paddock and tagged Ask Your Veterinarian, count fleet, flintshire, Keeneland January, Kentucky Farm Time Capsule, mind your biscuits, PR special, Stoner Creek Stud by Paulick Report Staff. Bookmark the permalink.